Are your children keen to get creative with recycled cardboard boxes? If so, get down Paris End Studio in Coburg this January, for the infamous Boxwars workshop for kids! If you don't know what we're talking about, Boxwars is a unique activity that is both art and destruction all-in-one! For the big kids aka grown-ups, Boxwars is all about building something from recycled cardboard, and then destroying it! Boxwars kicked off in Melbourne, Australia for the first time in 2003 and has been busting out workshops and battles for big and little kids ever since. 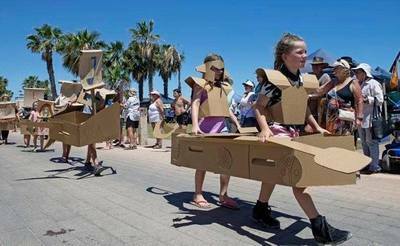 The Boxwars' Summer workshop on Sunday 22 January invites warrior kids and parents around Melbourne to join in with a fun day of creative destruction! The idea is to build your own creative masterpiece from recycled cardboard, which you get to take home. Veteran Box Warriors will be on hand to assist make your ideas into reality. Will you be a knight, a samurai, a warrior princess...anything you like! Parents are of encouraged to join in and build something too. You can also follow all the latest news on Facebook.